Age: 18 (19 in Project D) Car: Toyota Corolla Levin SR (AE85) (color: High Tech White) Height: 162.6 cm Weight: 54.9 kg Likes: Taiwanese bananas, races and race cars Dislikes: FDS, automatics, diesel cars Itsuki is Takumi's best friend and a member of the Akina SpeedStars. 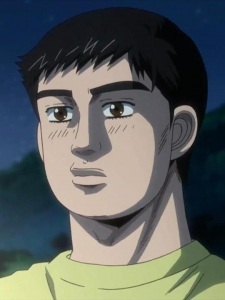 Itsuki provides the comic relief in the series, as he is the most enthusiastic of the whole street racing scene. Wanting to be more like Takumi, he accidentally buys an AE85 ("Eight-Five") Corolla Levin mistaken it for an Eight-Six. This upsets him until Takumi takes him for a drive (ultimately racing it downhill), demonstrating that the driver's skill can make a difference. With a car, he is a self-proclaimed member of the Akina SpeedStars. He eventually purchases a turbocharger for his Eight-Five.